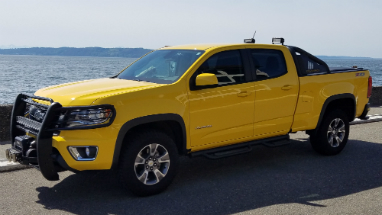 I have a 2017 3.6 Colorado Crew Cab short box with the General Motors receiver hitch. I'm planning on hauling my pro-touring 66 Mustang to Goodguys in Columbus, Ohio from my place in Arlington on a Uhaul aluminum car trailer with surge brakes. The car weighs 2600 lbs and the trailer 2200 lbs for a total of 4800 lbs. Will I need air springs or helper springs? Or am I good to go? Thanks for your help. 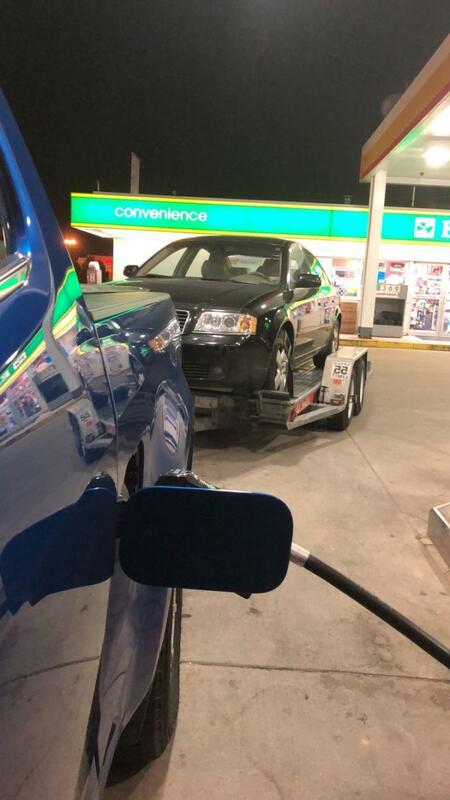 I towed a 2003 Audi A6 Quattro (roughly 4000 lbs) on a Uhaul car trailer with 3 adults and our luggage around 400 miles last fall without incident on I-75. I have the 3.6/8 speed with the factory tow package/trailer brakes so I have the 7500 lb hitch. I used a 1.75" raised receiver which put the trailer level with all of us in the truck and it handled it awesome. Felt stronger towing than the 97 Silverado I had before. You certainly dont NEED helper springs/air bags or anything. GraniteBlue05, 16WhiteColly and G92Z28 like this. I'm sure you'll be fine, the car transports are usually pretty well set up but it's annoying that you have to have the vehicle all the way at the front and can't position the car on the trailer to get the weight balance just right. If you think tongue weight is an issue you could try backing the car on to the trailer so you have less weight at the front, but I would pull straight on first. My bigger concern for you is ride height of your Mustang, the ramp and break-over angle where the ramps meet the trailer isn't exactly gentle, be very careful that you don't drag the bottom of the car on the rear of the trailer and think about having some planks handy to lessen the ramp angle if necessary. Also, you may have to climb in/out through the window, the fender on the trailer doesn't drop down low enough to allow the door to open very wide on cars that sit low to the ground. Xwd and G92Z28 like this. Correct, but I have had vehicles that were too low to open the door even with the fender down. The OP has a pro-touring car which is likely quite low and I expect they’ll have the same issue I had with door clearance. 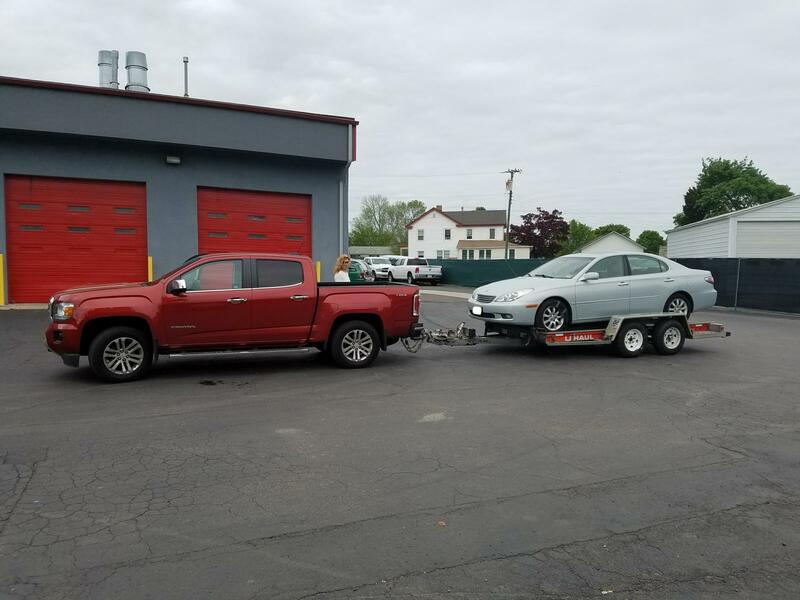 I hauled a Chevy Volt on a UHaul car trailer with a ZR2. 500 miles with no issues. Those trailers pull extremely well. Last edited by lil Dave; 04-11-2019 at 11:39 PM. Towed a 2002 Lexus ES about 100 miles a couple of years ago without issue. U-Haul gave me a hard time with their tongue weight calculations, and I don't think I technically met their guidelines, but I pestered them enough to let me take the trailer. I believe they also offer a lighter car trailer, but this was the only one they had available that day, and we were in a bind. All things being equal you will be fine. You are well within your GVWR. Thanks all, I really appreciate the help. The Uhaul trailer looks pretty impressive to me. Here's photo of the Mustang I'll be hauling. As you can see, it's not slammed. GraniteBlue05, DieselDrax and G92Z28 like this. In TFLTrucks tests the Colorado/Canyon squatted relatively little. If you're concerned I'd go with a weight distributing hitch over air bags. You can pick one up for about $200, but look for one that is easy to set up and doesn't require anything to be permanently attached to the trailer. I went with an Eaz-Lift model. My main complaint about that is needing to torque the bolts to 260 foot pounds. That required buying some heavier equipment than what I owned. WDH won't work with a U-Haul trailer, no place to mount any brackets due to the design of the tongue and frame. CaryBosse and 16WhiteColly like this. Really? Is it like this one at the 23 second mark? I assume that's a brake mechanism up front. Most U Haul trailers are equipped with Surge Brakes and WD Hitches are not supposed to be used with them, even if you could find a way to mount one. U-Haul uses a surge brake on their larger trailers to provide braking without the renter having to install trailer brakes. Not an expert here, but with the surge brake, the length of the trailer tongue will change as you stop, compressing the cylinder to apply hydraulic brake pressure to the wheels. I would guess that the changes in length, even if fairly small, would prevent a proper WD hitch setup. The big thing from U-Haul's standpoint is they want to make towing their trailers easy so any fool, even a Ridgeline owner, can do it. Correct, they're like that. Surge brake issue aside, the frame doesn't split into a Y until too far back, farther than WDH bars could reach. Most WDH systems have the brackets mounted around 28-29 inches back from the ball. Doesn't look like there's room to mount brackets until around 36" at least. I've pulled a stock IROC on a u-haul double-axle car trailer before. The fender drops low enough to open the door (minimal clearance, but it works). The bigger issue was the ramp angle. Had to use some wood scrap to get the front wheels to ride up high enough so the front spoiler wouldn't scrape pulling it on. You might have to get a little creative with the loading. Truck should pull it just fine. If the uhaul guys hook up the trailer, be sure to check their work when they're done. It's not that I don't trust them, it's that it's my load to pull. They're busy, they work fast, and they don't always have a lot of experience. CaryBosse, G92Z28 and Goodspike like this. I hauled a full size Range Rover to the dump on mine using a U-Haul trailer. No noticeable squat. There are pics on one of my anniversary posts buried in the threads someplace. I pretty much hit the max limit on my truck's towing capacity. I've accounted for clearance issues with ramps on U-Haul trailers by putting the storage post down, and using it to lift the tongue while still attached to the truck. DieselDrax and G92Z28 like this. When I bought my 1976 Firebird last November I rented a Uhaul trailer. I went on their website to reserve it and when I put in all the information it said my truck was not suitable for the load. 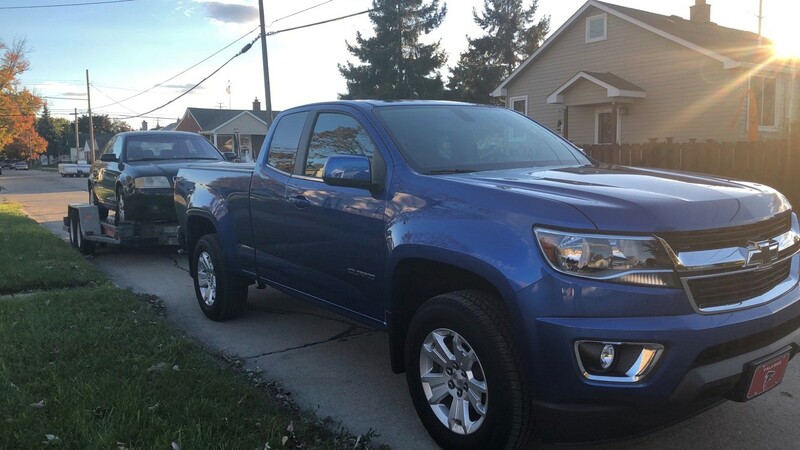 I borrowed a friends 2500 HD Silverado Duramax to pick it up. I was pleasantly surprised by my whole Uhaul experience. The person that hooked the trailer up was very knowledgeable. The trailer worked fantastic. The Firebird door cleared the fold down fender easily and the trailer loaded and towed fantastic. It was a surge brake trailer which is not as smooth as an electric brake trailer but it worked very well. I would definitely use them again. I was hoping to tow it with my 2018 Colorado but maybe Uhaul felt there was not enough safety margin with their trailer, my Firebird and the towing capacity of the Colorado.